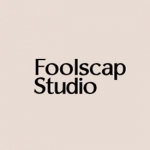 非常感谢 Foolscap Studio 予gooood分享以下内容。更多关于他们：Foolscap Studio on gooood. 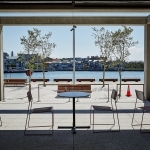 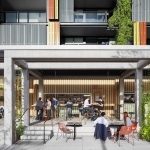 The much anticipated Wulugul Pop Up precinct is now open at Barangaroo(December 2015), a new 22-hectare mixed use precinct set to transform Sydney’s Harbour culture.Over the past year, award winning cross-disciplinary design practice Foolscap Studio has been developing the waterfront design scheme for Wulugul Pop Up. 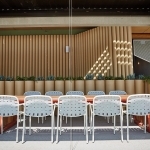 Foolscap’s focus was on how the Barangaroo precinct can “gradually become a place where local community, workers and visitors will enjoy the best of Sydney’s food, cultural and event experiences” throughout the next 10 months. 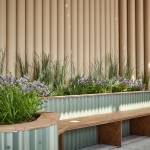 (A separate temporary restaurant project for global culinary heavyweight Rene Redzepi of Noma is currently underway, also designed by Foolscap, opening in January 2016). 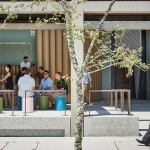 Working with Lendlease to deliver the project, Foolscap’s Wulugul Pop Up elevates simple natural materials into a world class public space. 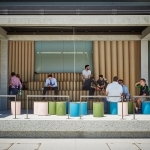 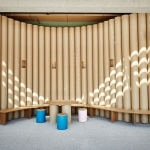 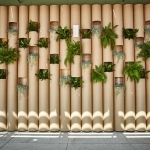 It is made up of an undulating facade constructed from especially engineered recycled cardboard tubes and sustainable local plywood that lines the entire 170m Barangaroo South waterfront at ground level. 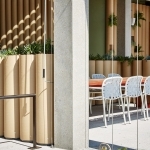 The design concept was inspired by the landscape, topography, cliffs and beaches found along Sydney’s Harbour. 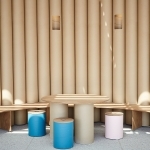 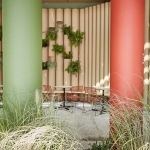 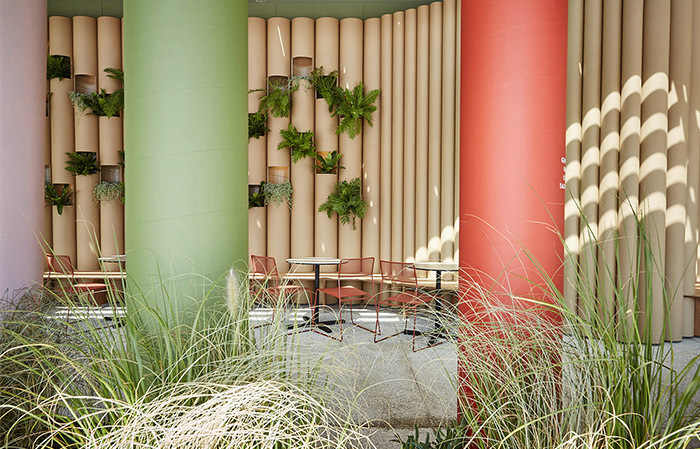 line the spaces, including clever yet simple green walls and an edible garden all housed within the large-scale card tubes. 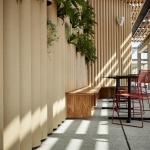 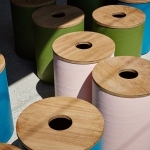 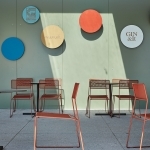 Foolscap’s design for the site elevates a simple recycled material to create a dynamic temporary architecture, a range of furniture and functional elements, seating pods, native planter gardens. 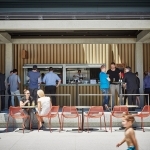 Custom designed food carts serve coffee, gelato and drinks along the promenade. 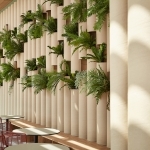 Foolscap also designed the signage and environmental graphics for the project. 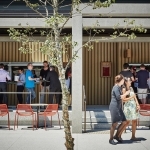 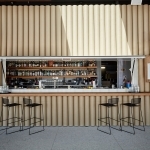 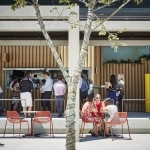 A selection of Australia’s best food and drink vendors have opened at the Wulugul Pop Up site: Edition Coffee Roasters, Gin&It (offering a huge gin selection by the Barber Shop) Riva Reno Gelato, Belle’s Hot Chicken and Mamak, alongside permanent Barangaroo tenants including local gem Bourke Street Bakery and many others. 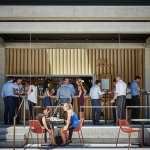 A Barangaroo Ambassador welcomes visitors to the Pop-Up, situated next to the Food & Beverage Hub, a cluster of hospitality operators housed within specially designed units within the card tube structure that open up to the waterfront terrace. 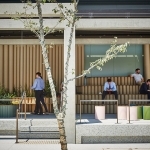 The ‘Dunes’, inspired by Sydney’s coastal edge, is made up of stepped seating, communal bleacher and native grasses and forms an undulating landscaped ribbon throughout the precinct. 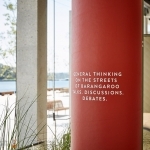 The Coworking Zone is a communal place to meet, share ideas and engage with new thinking outside of the office. 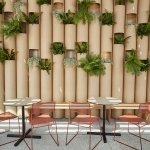 Custom designed furniture and lighting has been integrated into the cardboard tube wall, with landscaped low walls lined with succulents. 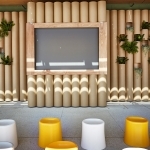 The Screen is where screenings, speaker series and digital exhibitions will be held. 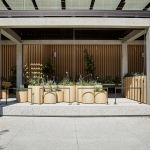 A Dwell Area includes daybeds amongst the greenery and Edible Garden where greenthumbs can learn about greening urban spaces. 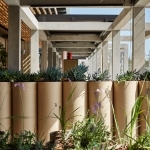 Predominantly recyclable or reusable materials with modular construction for ease of disassembly.